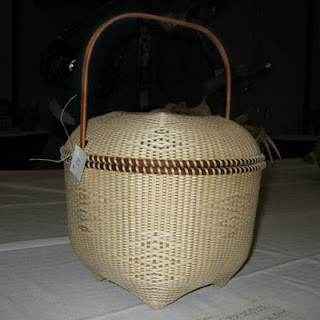 Here are a couple of photos of JoAnn Kelly Catsos' basket that won "viewer's choice" at the 2009 North Carolina Basketmakers' Association convention. Wow, what a beautiful basket. Cherry rims and handles with dyed uprights and natural ash weavers. I hope to see this basket in person when she comes to teach at my place in July. This basket is amazing in person. It was a surprise as it is a big basket and JoAnn is well known for her miniatures. Best of luck with your new blog. I will watch as it evolves. 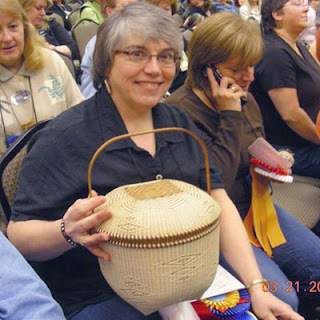 I had a chance to catch up with Jo Ann Kelly Catsos at the 2009 Northeast Basketmakers Guild Gathering. 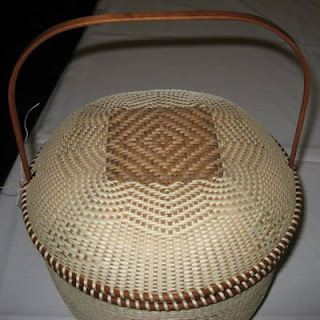 Her classes are always worth attending and as you are well aware, Black ash is a great basketmaking material.